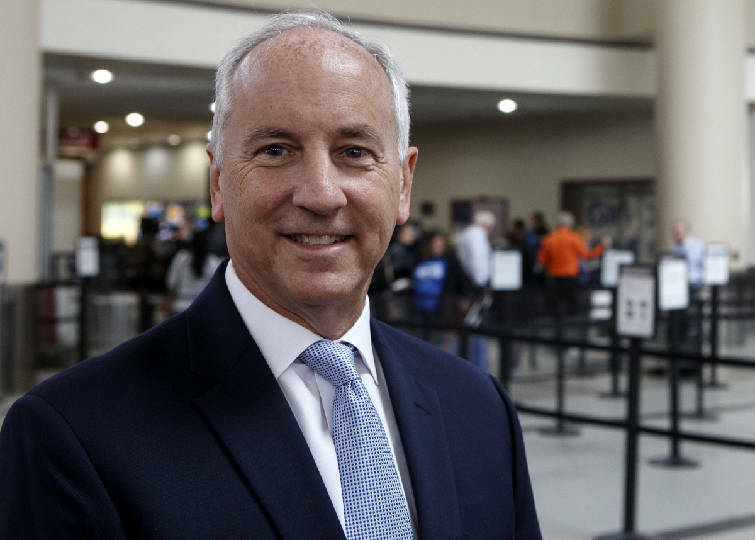 Chattanooga Metropolitan Airport CEO Terry Hart has overseen passenger traffic growth at Lovell Field from a little over 300,000 boardings in 2013 to an expected 500,000 this year. With about 70 percent of the airline seats at Chattanooga Metropolitan Airport filled by business travelers, Terry Hart says it's key to meet their needs to help fuel the city's growth. 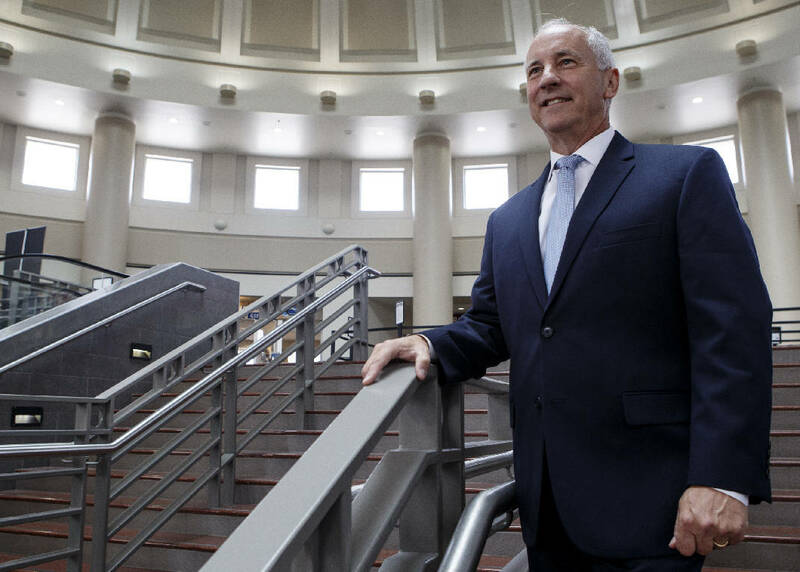 "If we succeed, it's important for the community, especially the business community," said the airport's chief executive officer, who has been named as the 2019 Chattanooga Area Manager of the Year. Staff photo by C.B. Schmelter / Terry Hart, CEO at Chattanooga Metropolitan Airport, says that a proposed parking garage is 'the No. 1 project' at Lovell Field. Background: Reared in New Castle, Ind. 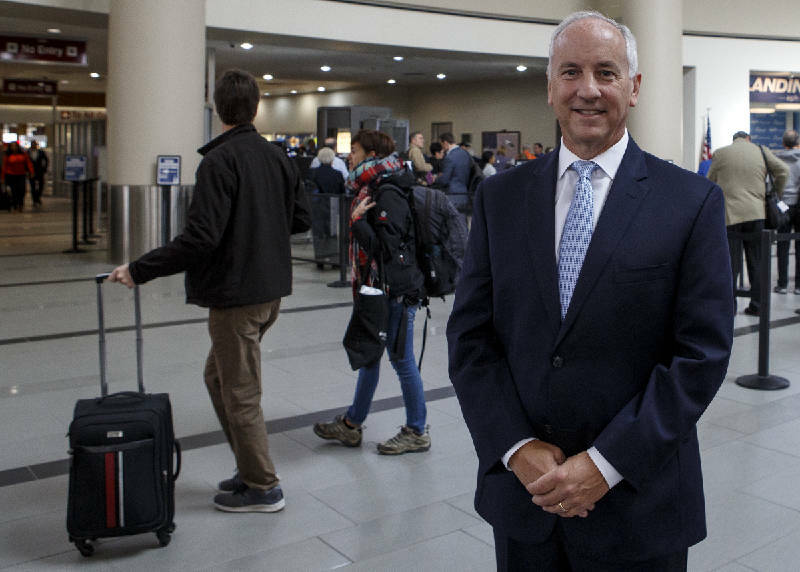 CEO Terry Hart poses at the Chattanooga Metropolitan Airport on Tuesday, Oct. 23, 2018 in Chattanooga, Tenn.
Hart is managing the explosive surge in passenger traffic seen at the airport over the past five years. From 309,235 boardings in 2013, Lovell Field has fielded four consecutive years of record-breaking traffic. This year, the airport is expected to surpass 500,000 passenger boardings for the first time ever, according to officials. From helping woo more commercial airlines and flights to Lovell Field to overseeing a new long-range plan charting the airport's future, Hart is dealing with the climbing numbers of air travelers in Chattanooga. At points on some days, that may call for the airport CEO to change out of a business suit into casual clothing to help navigate motorists through the crowded airport parking lots. "I'm not afraid to get into the trenches," he quipped. Richard Johnson, a member of the Manager of the Year executive and selection committees, said Hart's name rose to the top of "an exceptional number of candidates" for the award for 2019. Hart is the 33rd annual winner of the award given by a collection of Chattanooga area business groups. "It was very apparent looking at the growth and impact the airport has had," Johnson said. "Terry was very deserving. We're excited to have someone of his capabilities, what he does for the community and the way he gives back — to have someone of his caliber." Hart came to the Chattanooga airport in 2008 as vice president of operations and was elevated to the CEO post in 2012 after former chief Michael Landguth left for the same job in Raleigh-Durham International Airport in North Carolina. The 2019 Chattanooga Area Manager of the Year luncheon will be June 5, 2019, at 11:30 a.m. at The Chattanoogan. Contact Richard Johnson to reserve a spot at 423-774-0120 or richard@richnetmedia.com. To learn more about the award, go to camoy.org. 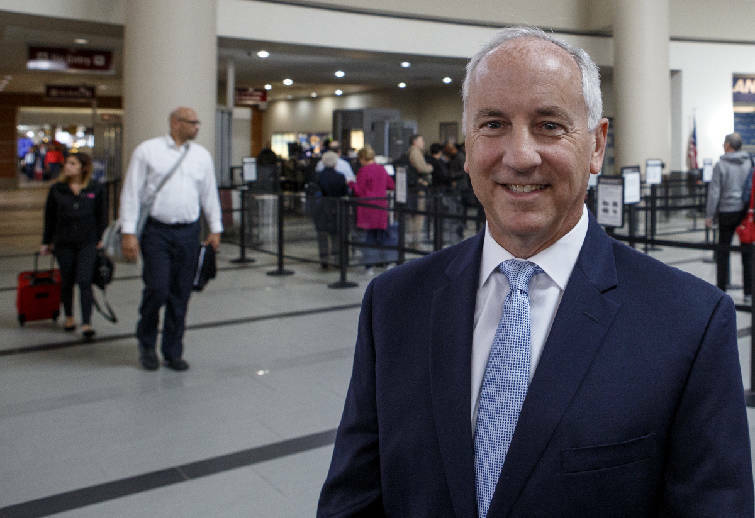 Dan Jacobson, the Airport Authority's chairman, said Hart's background as an executive with American Airlines and experience in Chattanooga was seen as taking the airport to "the next level." Hart had served American Airlines and American Eagle at the carriers' big hubs in Chicago and Dallas-Fort Worth. The Lovell Field chief said the Manager of the Year Award isn't just about him. "It's about the group and the work we're doing at the airport," he said. "It's a nice recognition. It recognizes the right things taking place." Hart said the airport staff's aim is to serve the users of Lovell Field, whether that's commercial airline passengers, air cargo companies, or general aviation. Overseeing the expansion of the aircraft maintenance company West Star Aviation and its high-paying jobs, which Hart called "a gem" at the airport, is viewed by the CEO as a vital task. "It's doing things that make a difference in the community," he said. Hart terms his management approach as "old style," with no one person better than anyone else. It's about the people and encouraging their willingness to buy in, he said. "We're doing those things that are taking care of the customers," Hart said. "It's staying focused on our goals." Top of mind for him at the airport these days is providing additional parking space for travelers. "There will be a parking deck," Hart said. He said that work on a 1,300-space parking garage near the terminal could start next year, calling the future structure is "the No. 1 project." In the meantime, airport officials have agreed to move forward with engineering services for up to 330 more parking spaces adjacent to a lot served by shuttle service to the terminal off Airport Road.